A warm cup of coffee and good conversation between sisters creates a lasting bond that can not be broken. Give your Sisters these Sisters Friendship Customizable Coffee Mugs to celebrate this unity. Our Personalized Mugs are Dishwasher safe and holds 11 oz. Includes FREE Personalization! Personalize your Sister's Coffee Mug with up to 6 names. Yellow heart is too light - does not stand out like the rest of the colors. Otherwise, all the cups were received with positive comments from the sisters. My wife had back surgey this past summer. I got this mugs for her and her sisters as a thank you for the help they gave me.All of them where very pleased with the gift. Our Personalized Sisters Coffee Mugs proudly display your love and friendship you have with your sisters. Select one for each of your sisters to celebrate your love for each other. 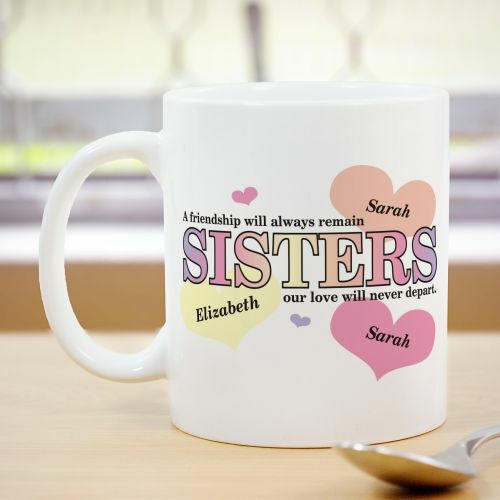 These personalized sisters coffee mugs make excellent gifts for your sisters on Sister's Day, Family reunions or just a special girls day out.